This really is one impressive bullaun stone, measuring around 2 metres long by 1.5 metres wide and almost a metre thick, the stone has been moved to here from it's original location. 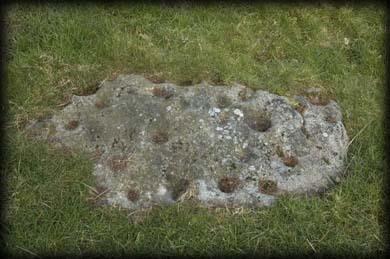 On the upper surface of the stone are three wonderful bullauns, two at the widest side of the stone and another towards the left of these, each of the bullauns are quite deep and are about 30cms wide. 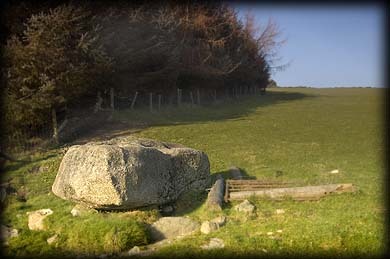 The stone is very accessible being located only 100 metres from the road. Straight up the field about 40 metres above the bullaun near the trees is a small rock art slab bearing over twenty cup marks. Part of the stone is covered by grass so there may be more, located NW of here in the same field is another stone also bearing cup marks. Situated: From Laragh head east on the R755, take the first left then drive 3 1/2 kilometres till you see a farm entrance on your right and a field gate on your left, these are at the bottom of a hill. the bullaun is in the field on your left about 100 metres west from the gate. Discovery Map 56: O 1553 0015. Last Visited Feb 2008.